NEW DELHI -- Americans and others in rich nations must alter their lifestyles if the world is to combat climate change, India's environment minister Prakash Javadekar said. 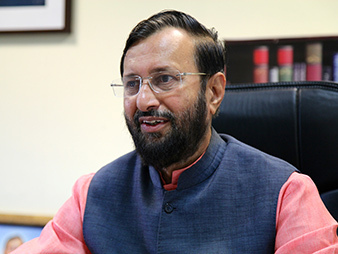 In an exclusive interview with ClimateWire, Javadekar yesterday called on wealthy countries to curb their per-capita greenhouse gas emissions and create room so that poorer nations like India can develop economically. Prakash Javadekar, India's minister of environment, forests and climate change. Photo by Gayathri Vaidyanathan. "My people have the right to grow," Javadekar said, adding that India's per-capita energy consumption is one-tenth that of the developed world. "We need carbon space, please vacate the carbon space which countries have occupied," he said. "We want free carbon space where our development can be parked." India, the world's second most populous nation and third-largest emitter of carbon dioxide, is a pivotal player in the United Nations' climate change negotiations. Those talks are expected to culminate in Paris in December with a global accord, and the extent to which India agrees to scale back its emissions will be a key factor in sealing that deal. All countries are expected to submit a climate plan -- called an intended nationally determined contribution -- to the United Nations ahead of the Paris talks. The United States has already announced it will reduce its greenhouse gas emissions 26 to 28 percent below 2005 levels by 2025. China has vowed to peak emissions around 2030 and reduce its carbon intensity by 60 to 65 percent below 2005 levels. Now many eyes are on India. Speaking in an office adjoining his heritage-style colonial bungalow with sprawling lawns in one of New Delhi's poshest neighborhoods, Javadekar insisted that despite India's pro-development agenda, the country will submit a plan to the United Nations that significantly cuts its emissions below business-as-usual levels. But, he said, India will not follow China's example and set a peak year by which its emissions will start declining. Instead, the government will offer to reduce its emissions per unit of economic growth, known as carbon intensity, and improve its energy intensity. "It'll be a very green path we are taking," he said. Javadekar said that the international community has not asked India to announce a year by which its carbon emissions would peak. India is home to 17 percent of the world's population, which has to be supported with just 2.5 percent of the world's landmass and 4 percent of the world's water resources. "The issue is, I need to develop, we must eradicate poverty, that's our challenge," he said. To do so, India has set an ambitious renewable energy target and plans to double its coal production by 2020. But while the nation's climate change policy comes under the purview of Javadekar's environment ministry, it does not control the nation's energy mix. The environment minister reiterated the nation's commitment to the core architecture of the U.N. Framework Convention on Climate Change (UNFCCC), which divides the world into developed and developing countries and mandates that wealthy countries have the responsibility to solve climate change based on historic emissions (ClimateWire, Dec. 10, 2014). Javadekar said that the UNFCCC's mandate and its principles of assigning greater responsibility to historical emitters and equity are the "bedrock agenda on which Paris will be built upon." Though developing nations do not have to take action under the current architecture, they are choosing to of their own volition and to the best of their capabilities, he said. Domestically, India has already set an ambitious goal to generate 175,000 megawatts of electricity from renewable energy sources by 2022. Javadekar said the country is looking for the billions of dollars needed to reach that target, and argued that technology transfer and intellectual property rights could be a hindrance in the future. He said the U.N.'s Green Climate Fund, which will channel much of a $100 billion annual commitment that countries vowed to mobilize for poor nations, could be leveraged toward this end. Private companies that own critical technologies could transfer technologies and be compensated using the fund, he suggested. He compared the situation to the provision of HIV/AIDS medicines where companies waived their intellectual property rights. "Why can't we do this for critical technology, and we can compensate the companies by the Green Climate Fund," he said. Correction: An earlier version of this article listed India as the most populous nation in the world; it is the second most populous.